We’re Just Down the Road! Better Broken Arrow Bail Bonds. Steven and Sandie Fletcher, owners of Signature Bail Bonds of Oklahoma have an office around the corner and live within minutes of the Broken Arrow Jail. We always strive to provide fast and friendly bail bond service in Broken Arrow. And if you need us in Tulsa, Sapulpa or any of the surrounding areas, one of our licensed friendly bail agents are always ready to help. FAST & FRIENDLY Broken Arrow Bail Bonds with SIMPLE RATES and FAST PROCESSING. Let us help with your Broken Arrow bail bond. 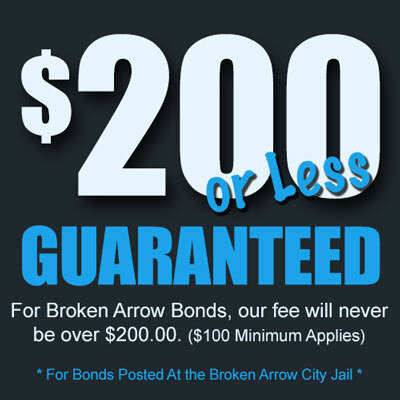 You’ll never pay more than $200 for any size Broken Arrow bond. Wondering how much you’ll pay for bail in Broken Arrow? We’ve made it super simple. Bonds Up To $750: $100 Flat Fee. Bonds $751-$1250: $150 Flat Fee. Bonds Over $1250: $200 Flat Fee. If we don’t have someone available to help, we can help you find someone who can. Signature Bail Bonds wants to help! Signature Bail Bonds’ agents live and work in the communities they serve and understand the local jail and court system. We can help you or your loved one navigate the unknown and unexpected. Let us help you get things back on track quickly.